Don’t allow bad past endeavors to last forever…to soothe wrongs, move on. 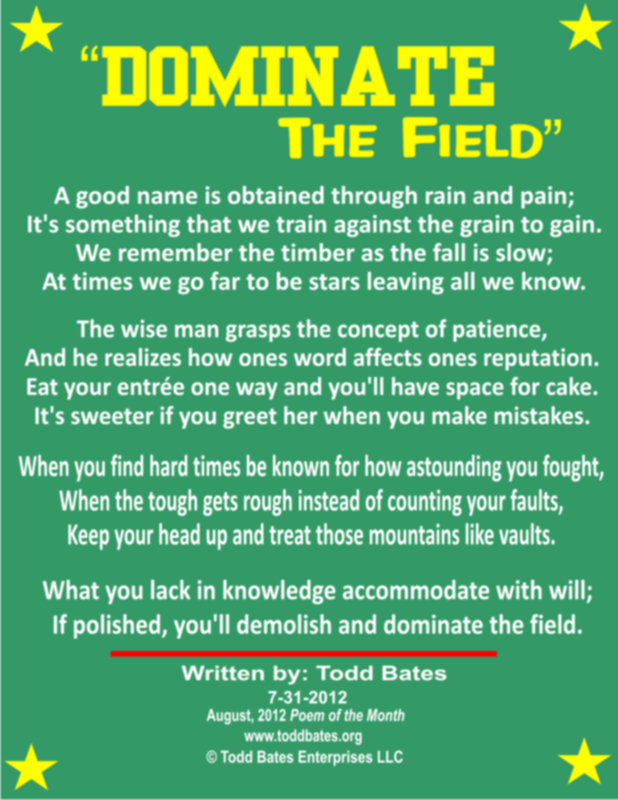 This poem is about overcoming adversity, dominating the competition, and understanding the importance of being consistent and honoring your word. God watches over His word to perform it and as His children we should do the same. When you fall treat the ground like a hot stove and get up. 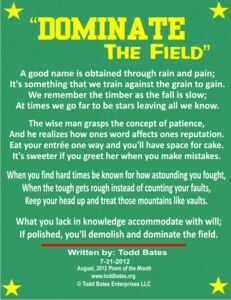 I pray the August, 2012 Poem of the Month touch your life and inspire you to be all that God called you to be. It’s something that we train against the grain to gain. At times we go far to be stars leaving all we know. And he realizes how ones word affects ones reputation. Eat your entrée one way and you’ll have space for cake. It’s sweeter if you greet her when you make mistakes. Keep your head up and treat those mountains like vaults. If polished, you’ll demolish and dominate the field. Thanks Todd. I think that one is my favorite one yet. Blessings to you bud.